In the wake of the mass shooting in Parkland, Fla., the media's treatment of students whose friends perished in the attack deserves closer scrutiny. It's arguable whether such students — who are obviously suffering through indescribable emotional trauma — should even be interviewed on national TV so soon after the tragedy. But the major media is showing no such circumspection. Instead, since hours after the attack, TV reporters have repeatedly trotted these kids out, put cameras in their faces, and urged them to make political statements about the attack. CNN's Alisyn Camerota has been at the forefront of this disturbing trend. On Sunday, she interviewed Emma Gonzalez, asking questions that in a court of law would be described as "leading the witness." Rather than focusing on the student's emotions, or the students whose lives were lost, or the overall experience for someone of Gonzalez's age, Camerota appeared mostly interested in scoring soundbites against Republicans and the National Rifle Association. "So what do you say to the NRA?" Camerota asked Gonzalez. "Disband, dismantle," the student replied. Camerota, seemingly unsatisfied, then asked another leading question, "I don’t have to tell you guys that they give millions of dollars to politicians. They have a very powerful tool. How do you expect politicians who need money to keep running for office to say no to the NRA?" Gonzalez then replied, "Because we keep telling them if they accept this blood money they are against the children. They are against the people who are dying. And that is — there’s no other way to put it at this point: You’re either funding the killers or you’re standing with the children." The next day, Camerota setup another interview with Hogg, telling him his last appearance was a big hit. "Your interview yesterday got a lot of attention with us because you made this personal appeal," Camerota said. "You just looked at the camera and you said to everybody listening, we’re children. You’re adults. Figuring this out. Children are dying. Did you hear from any leaders? Did you hear from anybody in power after that yesterday?" As Camerota seemed to already know, Hogg told her he hadn't heard from any elected leaders since his last CNN appearance. Camerota then upped the political ante, throwing to a clip of Sen. Marco Rubio suggesting no single law could prevent a tragedy like this, and asked Hogg to take on Rubio directly. "What do you say to that?," she asked. "Gun laws wouldn’t stop this, he’s saying." 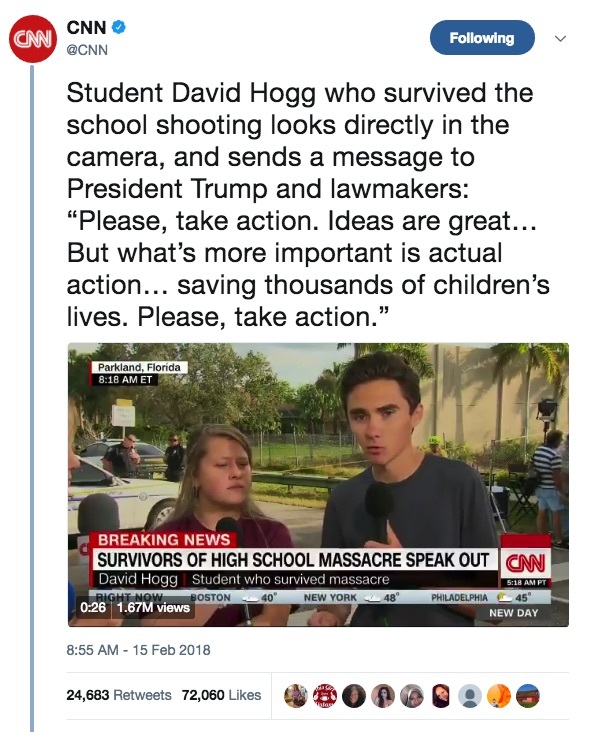 "I absolutely disagree," Hogg unsurprisingly replied. — "You said thoughts and prayers only go so far. They’re cold comfort. What do you want President Trump to do?" — "President Trump made some statements about this yesterday he spoke bit. He didn’t mention guns ..."
On ABC's "This Week," host Martha Raddatz encouraged a Parkland student, Cameron Kasky, to direct criticism toward Sen. Marco Rubio and Gov. Rick Scott: "Cameron, you had some very harsh words this week for Senator Marco Rubio, Governor Rick Scott here in Florida. You said they have blood on their hands." In a later segment, Raddatz teed up Parkland students to sound off on the secretary of education, Betsy DeVos: "You’ve heard — I think Betsy DeVos said teachers should be armed as an option." She then followed up: "Do you, David and Lauren, in terms of gun safety or gun legislation, do you think changes have to be made there?" On MSNBC, host Alex Witt invited students on to help promote a gun control march being planned in Washington, D.C., but also made sure she asked what the students thought of President Trump tweeting criticism of the FBI: "I want to get your response to the president as you know the FBI missed an opportunity potentially to Nikolas Cruz, the reason is they have spending so much time of Russian collusion and the Trump campaign, he’s putting these two entities together and the FBI. What do you think of this?" Back on CNN, the host of Inside Politics, John King, interviewed a 16-year-old student named Lyliah Skinner, urging her to say something to the "adults" that are skeptical new gun control laws will prevent future mass shootings. — "We just heard from you at that rally, you are now part of a group called 'Never Again.' Do you think that you and your friends are going to finally do what it takes to make a difference on this issue?" — "And Cameron, what is your message to the nation’s leaders after what you have been through?" — "And David, you just heard your friend there talk about this March, in March next month, what exactly are you hoping will come out of that?" — "Thank you all of you for your bravery and your just amazing ability to have presence of mind and to be able to speak truth to power in a way that a lot of grownups can’t do. I appreciate it." As you can see, the entire interview centered around using these kids to push for preconceived political action (note the absence of questions about school administrators, or the FBI, or local law enforcement, or pharmaceutical companies, or the federal background check system). Worse, the media has clearly already located the students they trust to serve up the hottest anti-GOP/NRA soundbites. After all, some students have expressly come to the opposite conclusion. Should these kids be as prominently featured in the media as they have been since last Thursday's tragedy? Let us know your thoughts in the comments below.